John Hoppner (1758-1810), Painter. Artist associated with 214 portraits, Sitter in 13 portraits. 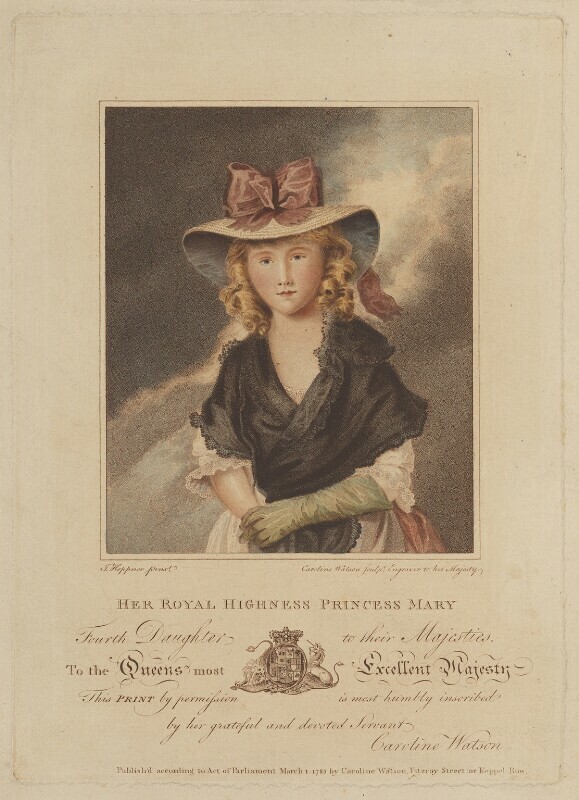 Caroline Watson (1760 or 1761-1814), Printmaker. Artist associated with 29 portraits. George Prince of Wales secretly marries his mistress Maria Fitzherbert in contravention of the Royal Marriages Act of 1772. Prime Minister William Pitt introduces a bill proposing parliamentary reform and the abolition of 'rotten boroughs' but is defeated. William Cowper publishes his best -known poem The Task. James Boswell publishes The Journal of a Tour to the Hebrides, narrating his travels with the late writer Samuel Johnson. Physician and naturalist James Hutton presents his studies of local rocks to the Royal Society of Edinburgh, launching the era of scientific geology. Warren Hastings resigns as Governor-General of Bengal and returns to England. His trial begins on charges of corruption in the administration of India. French sculptor Jean Antoine Houdon crosses the Atlantic to sculpt a statue of George Washington. British government establishes a permanent land force in the Eastern Caribbean, based in Barbados.